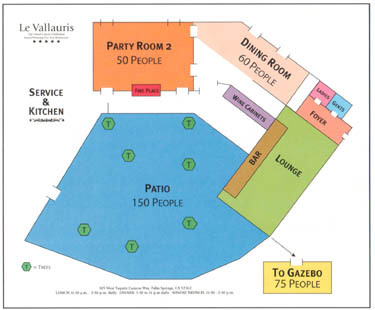 Thank you for considering Le Vallauris as the place for your function. We have included the following information which we hope will answer some of your questions and help you in your final decision. In order to arrange a banquet, a guarantee of the number of guests in attendance must be received four working days prior to the function. This number of attendance will be considered a guarantee. If the guarantee has not been received, the expected number of guests will be used as the final number of guests. In order to obtain one of our private rooms, a guaranteed minimum number of guests will be required. We will require a 20% deposit with your confirmed reservation. For catered weddings, a non refundable deposit of 20% of the food portion will be required upon acceptance of the agreement. All prices shown are subject to customary 20% gratuity on food and beverages as well as the applicable prevailing taxes. All food and beverage must be supplied and prepared by Le Vallauris. No food or beverages of any kind will be permitted to be brought into the restaurant. We will be happy to assist you with decorations. We cannot be responsible for any items left in the restaurant after the function. We are able to contract, on your behalf, transportation of any size. Please let us know if you want to avail this service.